When the weather warms up my family is itching to get outside! 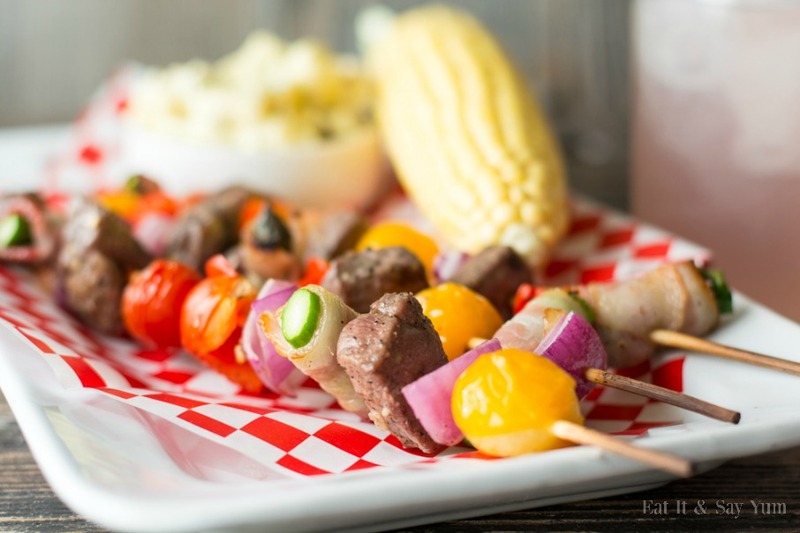 We love to grill out, and these kabobs are one of our favorites. When it comes to preparing a meal it doesn’t get much easier than chopping all the ingredients and sliding them on a stick. I like to use steak, even the cheap cut, because it stays more tender than a cut up roast, or stew meat. I cut my steaks (about 1 1/2 -2 pounds) into about 1 inch cubes- or slightly smaller. This way my meat is small enough that it will cook evenly with the vegetables. I love the flavor the vegetables give the meat when they cook right next to each other. I make a very simple marinade and let the meat soak in that before I put it on the skewers. Then I use the remaining marinade to brush on the kabobs before I grill them. One of my favorite elements of these kabobs is the bacon wrapped asparagus! I sprinkle some brown sugar over the bacon, to add a little sweetness. It gets nice and caramelized on the grill. Some of the vegetables I suggest are bell peppers, red onions, cherry tomatoes, zucchini, or any other you like. Just as long as they can cook quickly, not carrots or potatoes- unless you pre-cook them. Mix the marinade ingredients in a small bowl and set aside. Cut the steaks and place the cubes into a large bowl, sprinkle heavily with salt and pepper. Drizzle about 1/2 of the marinade over the steak and toss to coat. Cut, or slice all your vegetables. Place them in a separate bowl and set aside. Cut the bacon strips into fourths. Wrap each piece of asparagus with a piece of the bacon, place them on a pan then sprinkle all of them with brown sugar. 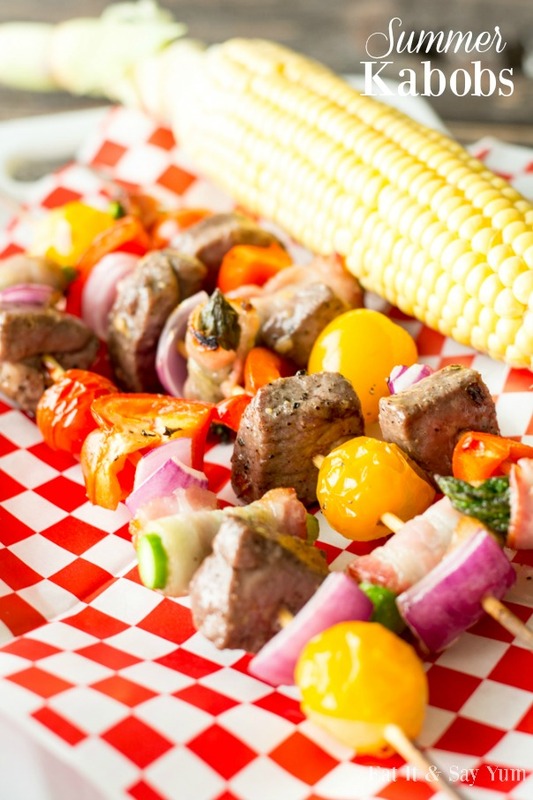 Skewer the meat, vegetables, and bacon wrapped asparagus- alternating as you go. No specific pattern, but I like the onions and bell peppers to be by the steak- go in whatever order you like. Make sure the bacon pieces are held shut by both sides of the skewer, and rub the brown sugar in as you skewer each piece. Place all the finished kabobs on a sheet pan, brush them with the remaining marinade. 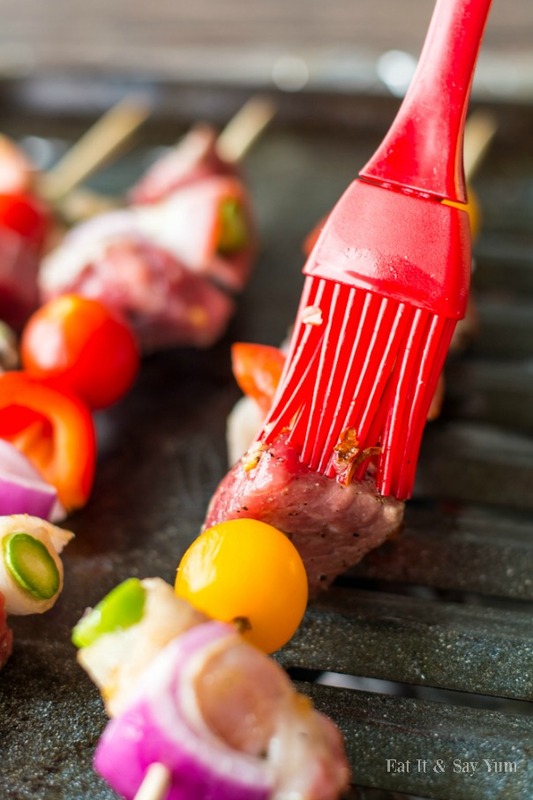 Place each skewer individually on a HOT grill, and rotate as needed. They will cook within a few minutes, because everything is in small pieces. Remove from heat and serve while hot. For more delicious recipes visit Eat It & Say Yum!